Thanks to the inimitable and ever-energetic Nikki Rowe and her daughter Caitlin, I’m pleased to be able to show you the Diana Gabaldon YouTube Channel! This includes a number of videos of me speaking in various places (such as at the West Virginia Book Festival), occasionally reading excerpts from upcoming books (there are a couple from Book Eight, WRITTEN IN MY OWN HEART’S BLOOD, read in WV, but listed separately, so people who want to hear the talk but don’t want to know about excerpts before a book comes out can enjoy the former without being inadvertently exposed to the latter), some musical bits—a trailer for OUTLANDER: The Musical, and the “Outlander Series Overture,” composed by a reader (and obviously a talented composer), and… ten million casting videos. I’m not going to comment on the casting videos, which run the gamut from…. well…. let’s just say there are enough of them that if you strung them end to end, you’d probably have the pilot for a mini-series, if not a whole two-hour feature film. For news/discussion on movies, mini-series, what-have-you, please click on the Other Projects button and menu above. 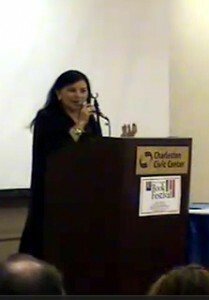 Images: At upper left is a still image from my talk at a West Virginia book festival, available for viewing on YouTube. 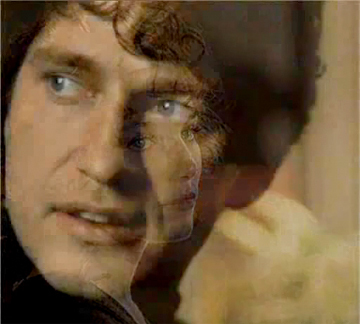 The right image is a still image from a fan casting video, imagining Gerard Butler as Jamie, with the image of an actress portraying Claire superimposed. This is one of thousands of casting videos available on the web, created by fans to showcase their favorite actors for an Outlander feature film.